Swansea goalkeeper admits he could be lured away from the Liberty Stadium by the right team. 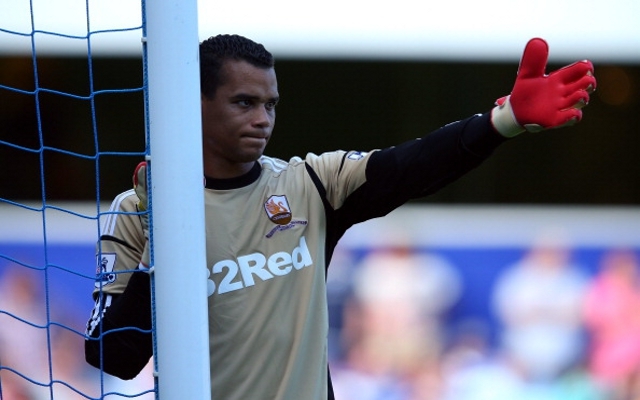 Swansea goalkeeper Michel Vorm has insisted he is happy at the Liberty Stadium. But that does not mean he could not be tempted away from the club by a team playing in European competition, according to The Daily Mail. Vorm has been in outstanding form this season for Swansea and has had praise lavished on him after a number of highly impressive displays. The Dutch goalkeeper has played a key role in the Swansea side that looks set to secure a comfortable top half of the table finish and was an integral member of the club’s Capital One Cup winning squad. But those performances have not gone unnoticed with a number of Premier League sides thought to be monitoring the player’s availability. The stopper has admitted that he would be tempted by a move to one of the game’s top clubs, as well as by a reunion with former Swansea boss Brendan Rodgers at Liverpool. ‘A reunion with Rodgers would be special. The collaboration was very good last season. But for now Pepe Reina is Liverpool’s first goalkeeper, and it is not an issue,’ said Vorm. Vorm has been one of Swansea’s outstanding performers since arriving at the club from Dutch side Utrecht for £1.5 million. He has since established himself in the Dutch national team and has found himself linked with some of the game’s biggest names, including Catalan giants Barcelona, Premier League leaders Manchester United and Arsene Wenger’s Arsenal.